Snippets of Jack: "Cruel is a matter of perspective." "Cruel is a matter of perspective." Our dear old Jack has returned from the dead. Much to the chagrin of Davy Jones; who lost his "little pet" the kraken because of it. After the meeting of The Brethren Court who elected Captain Elizabeth Swann as there king; Jack, Barbossa and Elizabeth had a meeting with Lord Beckett and Davy Jones and they discuss whether to fight or to end the argument right there. Pirates will be pirates and they decided to stick it out and fight of course. But Jack and Davy will meet again...very soon. During the last fight between Lord Beckett's British Navy and the Brethren Court's fleet; Jack and Davy lock in an epic battle for the chest that contains the heart of Dacy Jones and controls the fates of many men. One of said fates belongs to a very special man; Will Turner. 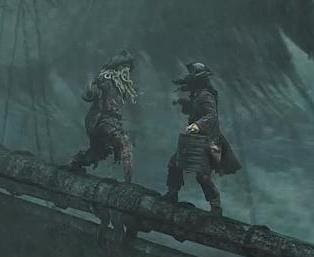 After saving his recent wife Elizabeth's life, Will Gets stabbed in the chest by Davy Jones. But his life is saved by the illustrious Jack Sparrow. In the end the good guys won, and Jack defeated the great Davy Jones. However Will only gets to see his beloved wife every ten years, but they make the best of it.